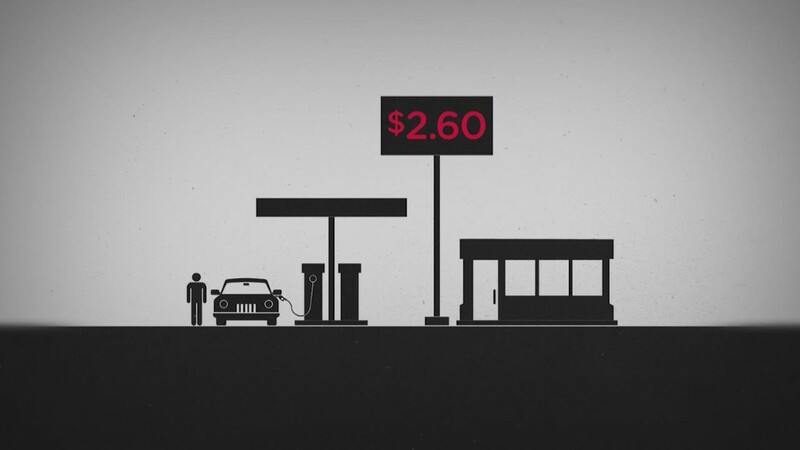 America is pumping so much oil that it's running out of places to keep it all. The U.S. now has nearly 503 million barrels of commercial crude oil stockpiled, the Energy Information Administration said on Wednesday. It's the highest level of supply for this time of the year in at least 80 years. The sky-high inventories are the latest sign that the U.S. oil boom is still alive and kicking. U.S. oil production is near all-time highs despite the epic crash in oil prices from $107 a barrel in June 2014 to just $30 a barrel now. 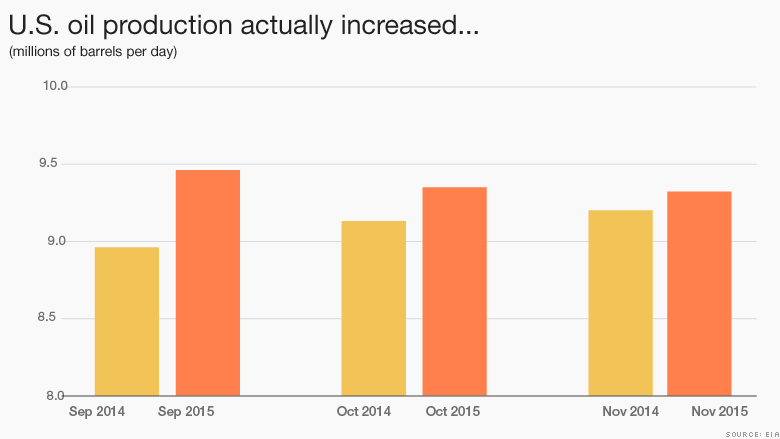 Sure, domestic oil production has slowed -- but just barely. 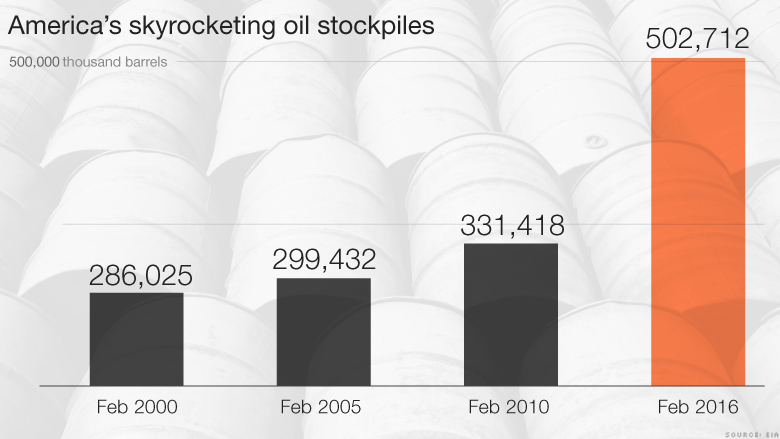 Oil stockpiles are so high that certain key storage locations are now "bumping up against storage and logistical constraints," according to Goldman Sachs analysts. In other words, these facilities are nearly overflowing. Cushing, Oklahoma is the delivery point for most of the oil produced in the U.S. This key trading hub is currently swelling with 64 million barrels of oil. That represents a near-record 87% of the facility's total storage capacity as of November, according to the EIA. "There is a fear of tank topping in Cushing. We're seeing it get to its brims," said Matthew Smith, director of commodity research at ClipperData. Cushing has had to ramp up its storage capabilities in recent years just to deal with all this oil. If this key hub ran out of room to stockpile oil, that crude would have to be diverted elsewhere -- and that would hurt oil prices. "There would be a ripple effect across the U.S. that would impact prices everywhere," said Smith. Global inventories also remain high, with the International Energy Agency recently saying the world is "drowning" in oil. The agency is bracing for oversupply of 1.5 million barrels per day in the first half of 2016. Wall Street is nervously watching supply constraints since they can have dramatic repercussions on prices. More so than other commodities, oil is vulnerable to so-called "operational stress" due to the expensive and sophisticated infrastructure that is needed for storage. "Each time the market brushes up against infrastructure constraints, oil prices will likely spike to the downside to make oil supplies back off," Goldman wrote. By comparison, it's relatively easy to pile up unwanted metals in an open space like a warehouse. "Aluminum only needs a grassy field," Goldman wrote. To put these storage issues into context, Goldman estimates $1 billion of gold would fit into a bedroom closet. Crude oil of the same value would require 17 supertanker ships that can hold about 2 million barrels of oil each. OPEC continues to pump oil at full throttle as it seeks to avoid losing further market share to higher cost producers in the U.S. and elsewhere. Many figured U.S. shale drillers would scale back much faster as prices fell. The latest EIA figures show that the U.S. pumped 9.32 million barrels per day in November. That's actually up 1% from the year before and not too far below (4%) the April 2015 peak.